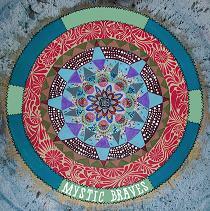 MEA CULPA - errare hum' perseverare diab' - so... Blackfeet Braves, now, are Mystic Braves : one thing doesn't change and for all seasons remains : this is a real nice 'n' cool record for the summer, this summer. lo-li-pop y.e.a.h! SOMETIMES all you need to make it through a long working day is a good and solid comp' : believe me this one's a serious contender & a good medicine !